As rioting by disaffected youths has spread across France, officials have been accused of long-term neglect of the country's impoverished suburbs. But over the past three decades, French governments of all colours have implemented an array of initiatives aimed at tackling widely documented problems. The first plan for the suburbs, focusing on better housing, was launched in 1977. After rioting near Lyon in 1981, the new Socialist government pioneered a large-scale "policy for the city" aimed at ending social exclusion. In the 1980s, hundreds of billions of francs were spent on regenerating housing estates, as well as extra funding for schools and youth associations in the suburbs. I hope there will be enough wise people in the neighbourhood to calm these young rioters. The next decade saw no let-up in government activity. In 1996, tax-free zones were set up, providing incentives for companies to create jobs in the suburbs. Last year, Social Affairs Minister Jean-Louis Borloo initiated a Plan for Social Cohesion aimed at tackling unemployment, discrimination and housing problems. The problem, it seems, is not one of neglect - but one of ineffectual action. 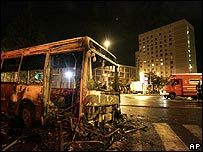 According to many French analysts, the worst wave of urban violence for many decades is a damning indictment of government initiatives. "If you do not accept that these policies have failed, what would it take to recognise failure?" sociologist Sebastian Roche said in an interview with the BBC News website. The law and order situation in the suburbs, he says, is much worse than it was two decades ago - even when there is no rioting. Neither has the economic plight of local youths improved: "We have the same inequalities as in the mid-1980s." As Mr Roche sees it, one reason for the failure is that urban policies have focused too much on "urban regeneration". In the late 1990s, for instance, the then Socialist-led government launched initiatives like 50 Great City Projects and 30 Urban Renewal Operations. Since 2002, the centre-right government has continued with this approach, demolishing high-rise blocks with gusto and investing heavily in new buildings. The bricks-and-mortar approach is all very well, Mr Roche says, but the underlying causes of the crisis, such as bad schools, have not seriously been dealt with. Another problem, he says, is that the money has been not been focused on the worst areas. Instead, it has been spread too thinly and used for patronage purposes. "What typically happens is that mayors of big cities go to the minister and ask: 'What about me?'" Mr Roche says. Francis Goddard, a professor at the University of Marne-La-Vallee, argues that the current centre-right government has made problems worse by putting a halt to the neighbourhood policing launched by the previous administration. "They have neglected grass-roots work," he told the BBC News website. Mr Roche agrees, saying that trust between residents in the suburbs and the authorities has broken down as a result. "French police are too remote," he says. "People in poor suburbs fear them." But some analysts argue that the problems faced by the suburbs are so severe that it is unfair to criticise France's long-standing "policy for the city". "If we had not had this policy in place, maybe the riots would have happened 15 years ago," says Fabien Jobard, a sociologist with the National Council for Scientific Research (CNRS). Furthermore, the crisis of the suburbs may reflect structural problems in France rather than misguided action by any individual government. Mr Roche points out that to improve education, you must allow local schools to choose their teachers and set higher wages. But this is unthinkable in the country's heavily centralised education system. France is also characterised by a high degree of social protection and many labour-market rigidities. This helps those already in work but prevents the creation of low-skill, entry-level jobs. The result is 25% unemployment among the young - and zero job prospects for the poorly-educated youths of the ghettos.